The year was 1632. A group of Franciscan friars in the town of Queretaro de Santiago, the capital of the modern Mexican state of Queretaro, had heard rumors that somewhere nearby Indians were still visiting a pre-Catholic shrine to give offerings to the old gods. Over a hundred years after the Spanish Conquest, it seemed impossible for this sort of thing to be happening well into the 17th Century in the central core of New Spain as most of the Indians had been Christianized generations before. About 5 miles from the center of the city of Queretaro, essentially right under the noses of the Franciscans, members of the Purépecha and Otomi tribes were secretly visiting a shrub-covered hill. The Otomi called the place Anbanica, which means “high temple” in English. The hill was really an old pyramid, one of the Franciscans noted in his journals, and it stood over 30 meters high. The Indians were praying to a female deity there, but it is unknown to which goddess the pyramid was dedicated as her name has been lost to history. The ruined temple was a serene place, free of human sacrifices and the formalized religious pomp of the Aztec Empire, and devoid of a permanent population surrounding it. The Spanish priests encountered peaceful indigenous pilgrims who had traveled from miles away to honor the goddess with small gifts of flowers and food and to ask humbly for favors from her. The Franciscans applied the “quick fix” to the situation and cleared away all the vestiges of what they considered to be devil worship and installed a small statue of the Virgin Mary in the place of the goddess shrine. Catholic priests were sent to the area to make sure that the natives maintained proper religious observances. Thus ended over one thousand years of indigenous worship at this place, the last major pyramid in central Mexico to lose its original significance. Located in the town of Corregidora in the State of Queretaro, the pyramid known as El Pueblito is part of the El Cerrito Archaeological Zone. The extent of the ancient settlement around the pyramid is unknown, as much of the surrounding area has been built upon in modern times, especially in the last 20 years. The modern city of Queretaro is the fastest growing city in Mexico as a result of foreign companies such as Dow Chemical, Samsung and Nestlé locating factories and offices there. In the 1990s the Mexican government decided to move quickly to protect the El Pueblito pyramid and the surrounding area from the damaging urban sprawl. By 1995, brush clearing and minor reconstruction on the pyramid began and by November of the year 2000, the formal archaeological zone was established. The area surrounding what is now the pyramid was first settled around 300 BC by people belonging to what has been termed the Capícuaro culture. With ample water sources nearby and good soils, the people settled down in villages raising grains and vegetables and eventually society became more complex. During the Capícuaro phase of El Cerrito we see in the archaeological record elaborately decorated pottery, along with complex funerary rites, and an architecture of simple low-lying stone platforms. It was clear that by about 100 AD the site had become a religious center for the settlements throughout the region. By 200 AD El Cerrito had fallen under the influence of Teotihuacan, the massive city-state located in the Basin of Mexico just northeast of modern-day Mexico City. Even though Teotihuacan was nearly 120 miles away, we see the influence of that city at El Cerrito in the style of the pottery fragments found at the site and in the amount of trade goods unearthed that had come into the city from the Teotihuacan trade networks. Because El Cerrito was in the center of a resource-rich area, archaeologists and historians theorize that the site was probably controlled by Teotihuacan as a vassal or client state. Teotihuacan’s control over the area lasted for almost 400 years, until about the year 600 AD. When Teotihuacan civilization collapsed, regional power centers emerged, and in this ancient Mexican “New World Order,” El Cerrito became an important political and religious center for the area to the northwest of the former Teotihuacan heartland. A century or so after the Teotihuacan collapse, we see the first of the three construction phases of the El Pueblito pyramid. A crude stone structure emerges measuring 80 meters by 80 meters at the base and about 20 meters high. Following is a period of rapid growth for the city. By 900 AD we see evidence of the Toltec culture at El Cerrito and between 900 AD and 1200 AD the city becomes one of the most important sites in the Toltec World. The population increased during this era and the architecture became monumental. During this Toltec occupation we see the pyramid undergo its second phase of development. It becomes bigger and more ornate, growing to 118 meters by 118 meters at the base and 30 meters tall. The building is covered in limestone and refinished in the talud tablero style of alternating boards and slopes, so common in ancient Mexico from the Teotihuacan era onward. During its third phase, in the later Toltec period, the pyramid is eventually painted in blue and ochre, which is applied to a stucco coating. During the height of Toltec culture at El Cerrito the El Pueblito pyramid becomes flanked by other important structures. Located in the southeast corner of the pyramid’s base is the Plaza of the Sculptures, a sunken patio measuring 72 meters long by 60 meters wide. In this public space we see sacrificial altars, areas for burning incense and a tzompantli, or skull rack, that was made up of over 50 human skulls. At the pyramid’s northeast corner is the Plaza de la Danza another public space built with basalt bricks and whose walls slope and were once painted red. Between the Plaza de la Danza and the Plaza of the Sculptures we have what has been called The Palace. Here archaeologists unearthed small altars and many offerings made of clay, some as large as 3 feet tall. The palace was a more intimate place for religious ritual located between two very public places. All three of these squares were surrounded by porticos supported by carved wooden columns decorated with crowns and covered in stone and stucco and painted red and blue. All the architecture of the Toltec period was ornamented with stone sculpture, whose function was that of public art, observable by anyone who visited the sacred areas of the city, a form of propaganda of the political and religious systems of the Toltecs. Stone plates with engravings were used to decorate walls, altars and sidewalks. The symbolism contained in this public art included representations of historical and mythical characters, deeds of warriors and important historical markers in the lives of the elites. Overwhelmingly, we see artistic representation of the powerful Mesoamerican god Quetzalcoatl throughout the site, in his many manifestations, from astral to aquatic. What has been called “Atlantean” sculptures, the gigantic carved columns like those found at the Toltec capital of Tula, have also been found at El Cerrito surrounding the pyramid along with reclining chac-mool sculptures and stone stelae, or monolithic monuments, found in connection with altars or at the bottom of staircases. Although fraught with artistic symbolism and decoration, none of the works of public art contained any script, as no formal writing system existed in this region at this time. The relative importance of El Cerrito during its height to the rest of Mesoamerica can be found by once again looking in the archaeological record. In the layers of this site corresponding to the Toltec era we find artifacts produced from as far away as Guatemala. Archaeologists theorize that they could have either been brought to the site in trade or by pilgrims. When Toltec influence started wane, so did the importance of El Cerrito. By 1250 AD we see the Toltecs withdraw from the area and the city began a rapid decline. Although the splendor of the city faded, its religious significance continued after the Toltecs left. A few centuries later, the Aztecs came to the region and started to exact tribute from the local area which was still resource-rich. The Aztecs never brought back El Cerrito to its former glory, but continued to visit the crumbling pyramid to pay homage to the gods as others had done before them. 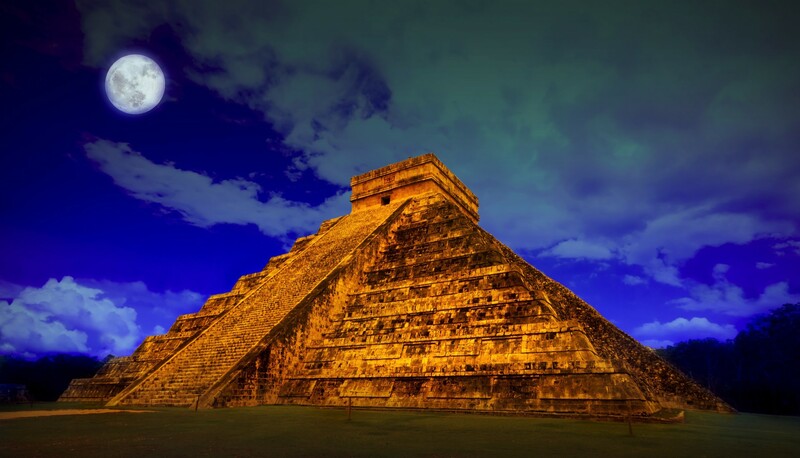 By the time the Aztecs were conquered by the Spanish, we see the pyramid still in use and as previously mentioned, the practice continued uninterrupted until the 17th Century. No one knows what happened to the small Virgin Mary statue the Franciscans brought with them to replace the goddess worshiped at the pyramid on that fateful day back in 1632. We do know that over the next few centuries the pyramid decayed even more and by the 19th Century became unrecognizable as a man made structure. The pyramid was always called a hill, or in Spanish, cerrito, hence the name of the archaeological zone. A curious aside to this pyramid story comes from the Fernández family, the people who, for many years, owned the lands now inside the zone. In 1876, they built a house on top of the pyramid now called El Fortín because it was done in a neo-Gothic style the way so many military structures were built at the time. Many modern visitors to the impressive pyramid consider the Fernández structure to be an eyesore, but even though the building is abandoned and in a state of decay there is nothing anyone can do about it. Under current laws in the state of Queretaro any building over 100 years old cannot be demolished and under these rules the seemingly out-of-place structure cannot be removed and thus the pyramid cannot be fully restored. It’s ironic that the same laws used to protect structures of cultural significance can also complicate and perhaps ruin the places they are meant to protect. For now, though, even with this eyesore, the future preservation of the archaeological zone of El Cerrito is secure. Perhaps sometime in the distant future that ugly 19th Century Mexican building atop the pyramid will be referred to as the pyramid’s 4th phase. We know at least, that this amazing place will definitely have a future and will continue to draw people to it as it always has. Thank you for the information. Am planning a visto Queretaro and will definitely explore El Cerrito. Another kudos to Mexican govt for preserving the indeginous cultures and art.